Sorry Corbynistas, there's no sign of a youthquake this election. But there are signs of a significant greyquake. While there's still time for that to change, it would have to be a massive upswing in 18-24-year-old enrolments in the 11 days from 12 September to the election. I was spurred into looking into the Electoral Commissions numbers by a friend who had heard talk of a youthquake but couldn't see it showing up in enrolment figures, and initially I was trying to compare enrolments as a percentage of eligible population. Then I realised that it was a tad difficult to do as I could only compare off the 2013 Census numbers, and there's been reasonable population growth since then. Instead I decided to breakdown the overall makeup of the enrolled electors in each election year, as it's ultimately the demographic makeup of voters that's more relevant in seeing changes. It doesn't particularly matter if more young people vote if they're balanced out by more superannuitants voting. 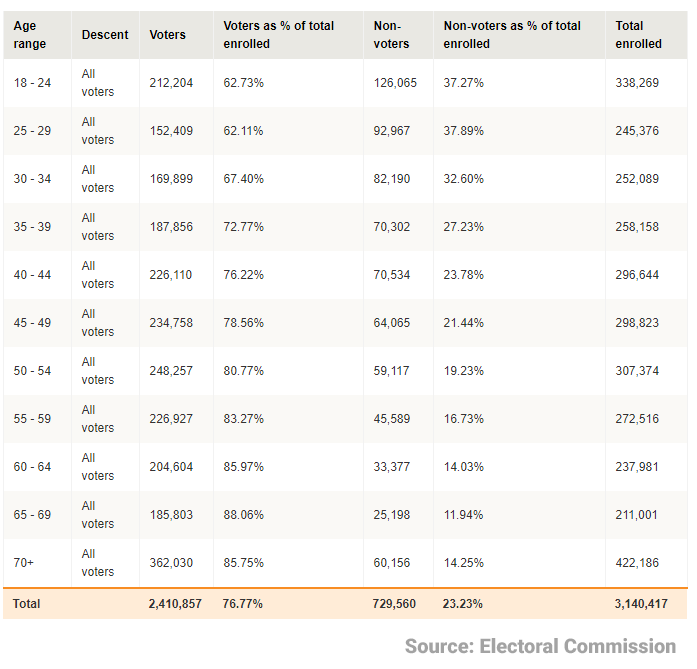 What the current data shows is that it's the exact opposite happening, the 2017 elector population is looking like it will have a higher representation of those over 55 than in 2014, and that doesn't particularly help parties like the Greens who focus so heavily on the youth vote. It could also be holding back Jacinda Ardern's numbers slightly too as Labour has also been heavily focused in getting out the youth vote, which simply doesn't seem to be happening. As we've seen overseas, older voters tend towards supporting centre-right to right wing parties, meaning both National and NZ First's numbers could be supported more than otherwise may have been the case. The other important factor is that young people are less likely to turn out to vote than older people. That means the impact of this potential greyquake could well be compounded as those voters, especially aged over 70, amplify their presence more than normal at the same time as younger voter numbers are down along with their lower turnout. Sadly I can't see this improving until civics education is ramped up in our secondary schools. I'm also working on seeing how the enrolment percentages look compared to the estimated eligible population, but that's a bit trickier due to the need to estimate 2014's population, especially those aged 18 and 19, so will blog on that later. Voter turnout in the 2014 election by age cohort demonstrates the double whammy that a larger grey percentage of the voting demographic will have on the 2017 election. More older New Zealanders voting at a higher rate means they're having a larger impact than younger New Zealanders who don't turn out to vote. Update: 3:15pm - I've just had a play around with some data trying to get a view on how enrolments are tracking as a percentage of the population for each cohort. It does show a potentially big gap in those under 34 who haven't enrolled to vote yet, relative to how other cohorts are tracking relative to 2014. It's not perfect, as the data for 2014 is an estimate based of the 2013 Census data, and it doesn't remove those who are ineligible to vote, as well as the 18 and 19-year-old sections of the 18 - 24--year-old cohort being estimated based off the overall population growth in the 15 - 19-year-old cohort in the June 2014 estimates from Statistics NZ.